Action from FC Peterborough (yellow) v Brotherhood Sports in November. Brotherhood Sports have set up a mouthwatering all-city final in the Northants Area Cup, and manager Chris Barnes can’t wait for the end-of-season showpiece. 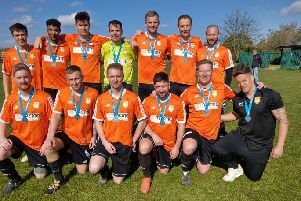 Sports will tackle Peterborough Division Three rivals Bretton North End in the final, after battling to a 2-0 semi-final win at Byfield Tigers last weekend. Brotherhood Sports manager Chris Brown. A goal from a corner in each half by Michael Uff and Daryn Whiteman secured a deserved victory on a difficult surface. “The referee was all set to call the game off when we got there after a 90-minute journey,” Barnes revealed. “But both managers managed to talk her around and my lads battled really well to get a win we deserved. “We tried to play good football on a poor pitch, but they just lumped the ball forward and chased it. My back four were excellent and it’s a great win which has set up what should be a great final. “We’ve played Bretton once in the league and beat them, but they have signed a few players since then. If we play to our best we will have a good chance of winning, but they will think the same. Action from FC Peterborough's 2-1 win over Brotherhood Sports in NOvember. “We still have a chance of winning other trophies as well. The league is within our reach and we have a PFA Junior Cup quarter-final at FC Peterborough on Saturday (February 25). Barnes has transformed Sports from a Sunday morning team - “We had an average age of about 40 when I took over” - to a progressive Peterborough League side. They won Division Four by 10 points last season and are currently 13 points behind FC Peterborough, but with six matches in hand. Bretton continued their own top form with a 9-0 thrashing of Whittlesey Athletic B in a PFA Junior Cup quarter-final last weekend. Eye United, another strong Division Three title contender, were surprisingly beaten in the same competition 3-0 by Rutland Dead Rabbits. Joe McDonald hit a hat-trick for a team seeking a third PFA Final appearance in a row.